A successful businessman as well as physician, Dr. Michael Lange has started many successful businesses across Florida over the past 18 years. Known as the “Ocala Eye Doctor” and the talk show host on “Ask the Dr.,” Dr. Michael Lange also serves as the founder and CEO of the Lange Sun and Nutrition Center in Clearwater. This company is a center that offers unique and hard to find organic vitamins, herbal supplements, organic coffees, teas, and wines along with a dedicated sunglasses area. Like all his other efforts, Dr. Michael Lange’s latest venture is a great success. Nutrition and optometry are Dr. Michael Lange’s passions. Over the course of his career, he has continued to expand his interests in eye care, vision awareness, and nutrition in new ways. Dr. Michael Lange started Lange Eye Care and Associates in Ocala in 1993 and now operates nine primary eye care centers around the state. He’s created two successful Internet companies, Express Contacts and Express Sunglasses. Realizing his growing interest in the nutritional aspects of health, Dr. Michael Lange built up the successful Fortifeye Vitamin company. Dr. Michael Lange currently functions as the CEO and Chairman of Parris Optics International, an innovative eyeglass frame design company. In June 2010, Dr. Michael Lange opened the first eye care center in the country that utilizes the latest Zeiss Eye Scription refractive technology. When he’s not running one of his businesses, Dr. Michael Lange enjoys motocross, mountain biking, road biking, skiing, tennis, and spending time with his family. He serves on multiple advisory boards for the eye care, optical, nutrition, and organic food industry. 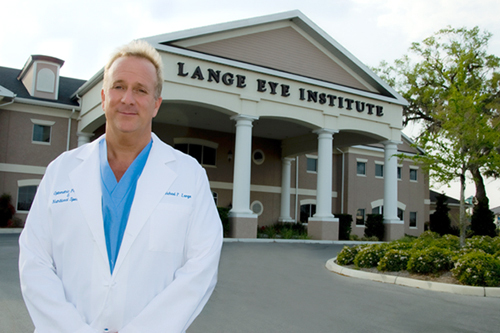 Dr Lange also writes frequently for many eye care magazines and is a moderator on several eye care-related websites. He is a frequent lecturer on eye care, practice management, and nutrition. A Certified Nutrition Specialist by the American College of Nutrition, Dr. Michael Lange is also a Florida Department of Health certified Optometric Physician. This entry was posted in Uncategorized and tagged Lange, Michael, Michael Lange, Michael Lange Ocala, Michael Lange Optometrist, Michael Paul Lange, Optometrist. Bookmark the permalink. Dr. Lange has really helped my vison and entire body/life! I was referred to Lange Eye Care by my family doctor since i am a diabetic to make sure it wasnt in my eyes. Dr. Michael Lange was the first Optometrist i have ever seen and I have to tell you , he changed my life. He took the time to detail a diet, vitamins and exercise plan for me and wrote every thing out for me in easy to follow directions. well a long story short i have lost 80 lbs and no longer need to take diabetes medicine, Dr. Lange got me interested in mountain biking and i am actually going to enter my first race this summer. My vision has also improved now so i dont need the distance glasses anymore. My eye doctor, Dr. Lange was the only one that really took the time to help me, he really cares for his patients. I just wanted to comment on the supurb care I had from Dr. Lange Optometrist at Lange Eye Care in Ocala on state road 200 location!! I have been in a bind many a time and Dr. Lange and his staff has always been there for me. I moved to Ocala Florida in 1997 and had a real swollen eye the day i was moving in. Well i was driving down the street and saw the Lange Eye Care sign and went in and saw Dr. Michael Lange for the first time. He took me right in and treated me immediatley! I have been his patient ever since and wont go anywhere else. I have a similar story to Clays above, Dr. Michael Lange has been an inspiration to me over the years. I first started listening to him in 1996 on WRN 720 am in Ocala when he was on at 4pm then he changed times and I lost him for a while and then picked him up again on a station out of Tampa. I am a loyal listener of his show “Ask the Dr” and have really tried to do what he says with proper diet and exercise. I have lost 55 lbs in eight months and my blood chemistries have all normalized and off all meds thanks to his imformative show. I have been going to Lange Eye Care in Ocala for the last ten years for my eye exams and have always been pleased with the doctors I see. Dr. Lange really takes a great deal of time when he examines my eyes and always explains things in easy to understand terminology. One day when I get brave I will have Lasik surgery. I recently went to Lange eye care Gainesville location and saw a very good optometrist named Dr McClintick. I was able to get my supply of contacts and a new pr of glasses all at the same visit , they made my glasses in about thirty minutes. I was very happy and will bring my children to Lange eye care Gainesville Thanks Dr. Lange for being open on Sunday. That helps us working moms. I visited the Gainesville Lange Eye care Center a few weeks ago and decided this would be my Eye care Center from now on. I saw Dr Michael Lange that day and he took his time explaining everything to me. I have Maccular Degeneration and he was most knowledge about this. He gave me some really good information. Dr. Michael Lange is now my Optometrist thanks to this blog. I want to first comment on how well the staff treated me in the Ocala office. I have a very complicated glasses prescription because my eyes are really bad! I used to have coke bottles until i went to contacts. Dr. Lange and his glasses sales person found a pair of glasses that are very stylish and the lenses are the thinnest i have ever had. I have never had the doctor take the time to actually help me determine what type of frame worked best for my bad eyes. Now finally I have glasses I can wear when giving my eyes a rest from my contacts that dont make me look like I am wearing coke bottles. Michael Lange the Optometrist at Lange Eye Care in Ocala has my highest recommendation. I drive from Brooksville and its worth the drive. Dr. Michael Lange Optometrist on the radio helped me significantly, he is extremely smart but very kind as well. I appreciate all u do for your listeners from your radio program.